LAKEFRONT ON THE ONLY LAKE COMMUNITY IN OKOTOKS - CRYSTAL SHORES! 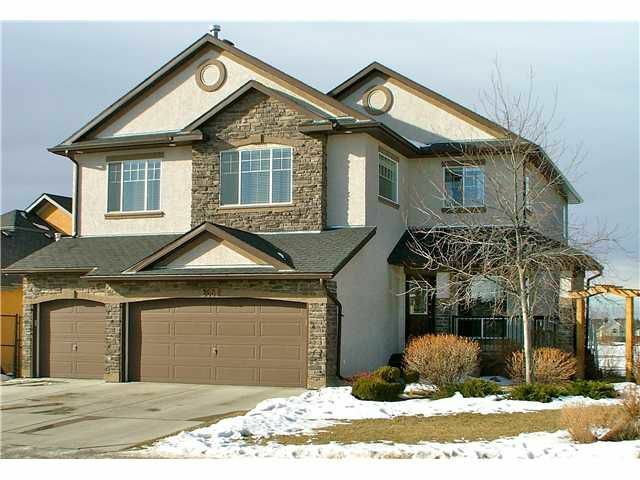 Fantastic lakefront family home located in prestigious Crystal Shores of Okotoks. Boasting almost 3,500 sqft of developed space, this lovely home offers 5 bedrooms, spacious bonus room & private office, fully developed walk-out basement with wet bar, triple car heated garage, walnut hardwood flooring, brand new carpet & plenty of custom built-ins. Kitchen offers beautiful maple cabinets, granite countertops, gas range, stainless steel appliances & undermount sink. Fresh paint throughout. Exterior features include professionally landscaped yard with maintenance free decking,flagstone patio surrounding fire pit, underground sprinkler system & covered patio, your own dock, all right on the lake. Easy commute to Calgary. No need to drive for hours to get to the lake..it's all here in what could be your own west facing yard. Enjoy the lake year round! 2 yrs left on Alberta New Home Warranty Program extended coverage.